Worldwide prevalence estimates of amputation are difficult to obtain, mainly because amputation receives very little attention and resources in countries where survival is low. 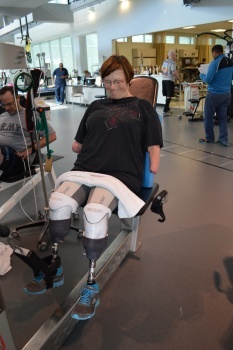 Limb loss can be the result of trauma, malignancy, disease, or congenital anomaly. Peripheral Vascular Disease is the most common cause of limb loss overall, with the rate of dysvascular amputation being nearly 8 times greater than the rate of trauma related amputations, the second leading cause of limb loss. In recent years in the United States 80% of new amputations per year are as a result of dysvascular disease. Multi-limb loss could be the result of many reasons like trauma, cancer, and congenital abnormalities however, in recent years multiple amputations due to dysvascular disease escalated. Peripheral Vascular Disease is also known or referred to as Peripheral Artery Disease or lower extremity occlusive disease. It affects the peripheral vascular system, mostly the arteries, and is a manifestation of systemic atherosclerosis and atherothrombotic conditions which may include stenotic, occlusive and aneurysmal disease. The peripheral vascular system consists of the veins and arteries beyond or distal to the chest and abdomen supplying the arms, hands, legs and feet. Atherosclerosis, which is the process of Peripheral Arterial Disease (PAD), affects several arterial beds including the coronary and peripheral circulation. 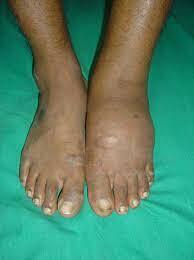 Peripheral vascular disease is thus considered as a form of cardiovascular disease. Its onset is gradual but progressive. It is often asymptomatic but causes serious effects. Atherosclerosis is commonly seen with an increase in age in adults and elderly. In peripheral arterial disease, there is build up of fatty deposits in the walls of the arterial system. These fatty deposits, also known as atheromas, cause a reduction in the lumen of the arteries. The reduction in the lumen causes stenosis and restricts the blood flow and supply to the particular area affected. The illustration shows how P.A.D. can affect arteries in the legs. Figure A shows a normal artery with normal blood flow. The inset image shows a cross-section of the normal artery. Figure B shows an artery with plaque buildup that's partially blocking blood flow. The inset image shows a cross-section of the narrowed artery. An increase in age brings about related vascular changes also known as arteriosclerosis. It may be referred to as hardening of the arteries where there is generalised degeneration of the elastic tissue and muscles composing the arterial system. This tissue is replaced by fibrous tissue and the elastic vessels become harder with stretching of collagen and calcium depositing in the walls of the arteries causing them to become hard and tortuous. 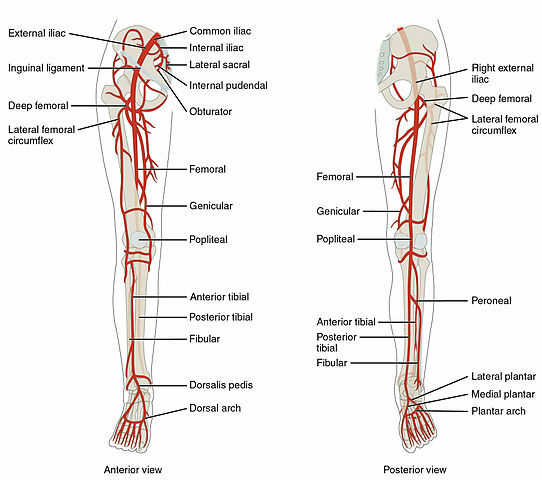 In the case of peripheral circulation where the arteries of the lower limbs are affected, pain and tissue damage develop which may eventually lead to amputation in some cases. Patients suffering from peripheral arterial disease present with pain referred to as Intermittent Claudication. It is defined as reproducible ischaemic muscle pain. This type of pain presents after physical activity such as walking. In individuals suffering from PAD the blood flow in the lower limbs is reduced due to processes causing stenosis. Blood circulation is usually sufficient when one is at rest, however when one starts walking and the demands are greater the blood supply is not sufficient to the lower limb muscles causing cramps and pain. Thus such pain gets worse with greater demands example: when walking uphill and improves or is relieved after a short rest. Ankle-Brachial Index (ABI) tool (Calculated as the ratio of systolic blood pressure at the ankle to that in the arm where the normal range is 0.9-1.1 whilst a ratio of <0.9 indicates PAD). Ultrasonic Imaging - this is used to determine or investigate lower limb vascular disease. This includes Duplex Scanners and Colour Doppler scanners. 'Ultrasonic scanning is now established as a valuable non-invasive method for investigating lower-limb vascular disease. It is the first method of choice for arterial stenosis and occlusion, and for venous incompetence. Ultrasonic imaging is non-invasive and can provide clinical information about the site and severity of narrowing of arterial vessels or of any blockages of main vessels. 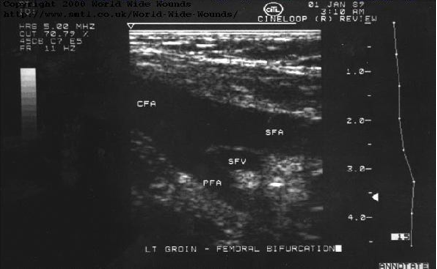 Where multiple stenoses are present such imaging can determine which stenosis is causing more restriction to blood flow. The Common Femoral Artery (CFA) divides into the Superficial Femoral Artery (SFA) and the Profunda Femoris Artery (PFA). Arterial Blood flow is from left to right. The skin surface is located at the top of the image whilst markers on the right indicate depth in cms. Diabetes is also another condition that has an effect on the pathology that may lead to lower limb amputation. 28% of people with a foot ulcer develop another foot ulcer within a year. The risk of amputation is higher where peripheral vascular disease and diabetes coexist. 74% of people with dysvascular amputations are comprised of patients with diabetes and dysvascular disease as a co-morbidity, and 55% of these patients will have an amputation in their contralateral limb 2-3 years after their initial amputation. Another scary statistic is that 50% of patients who underwent an amputation due to vascular disease will die within 5 years of the amputation. Diabetes Mellitus (Type 2) Diabetes mellitus is also present in almost half of all cases, and people with diabetes mellitus have a 10 times higher risk of amputation. It is characterised by chronic compensatory hyperglycaemia that results from progressive insulin resistance especially in muscle tissue together with insufficient pancreatic secretion of insulin to aid glucose uptake in tissues . Diabetes Mellitus usually has an insidious onset and presents as persistent hyperglycaemia. This is defined by the American Diabetes Association as a fasting plasma glucose level ≥126mg/dL. Potential complications of DM include diabetic retinopathy, nephropathy, hypertension, neuropathy, coronary artery disease, diabetic foot ulcers and peripheral arterial disease. Patients who suffer from Diabetes Mellitus are at a high risk of developing ulcers and associated complications. Studies indicate that diabetic patients have up to a 25% lifetime risk of developing a foot ulcer. Peripheral neuropathy and ischaemia from Peripheral vascular disease are two contributing factors to the development of foot ulcers. Once a foot ulcer develops there is a high risk of wound progression that may lead to complications and amputation. On analysing causal pathways for diabetic lower-limb amputation foot ulcers preceded around 84% of amputations. Foot ulcers are considered to be reasonably common and they not only affect the patient's functional status and well being but can also identify individuals who may be at a higher risk of amputation. Ulcers result from neuropathy and ischaemia. In diabetic individuals the hyperglycaemic-induced metabolic abnormalities cause a conversion of intracellular glucose to sorbitol and fructose. The accumulation of these sugars cause a reduction in the synthesis of products required for normal nerve conduction and function. The chemical conversion of glucose will also increase the oxidative stress on nerve cells and lead to further ischaemia and thus causing further nerve cell injury and death. Neuropathy in diabetic individuals affects the motor, sensory and autonomic components of the nervous system. Sensation and proprioception input is decreased. The innervation of the intrinsic muscles of the foot is affected and damage leads to an imbalance between the flexors and extensors of the affected foot and therefore causing anatomic deformities. Such deformities include the toes being pulled up into a hammer toe or claw foot flexion deformity. These will cause abnormal bony prominences and pressure points, such as on the tops of the toes or under the metatarsal heads, which may eventually lead to skin breakdown and ulceration. Further damage may be caused through the affected autonomic nervous system. Autonomic neuropathy causes the reduction in sweat and oil gland function with the foot loosing its natural ability to moisturise the overlying skin. The skin becomes dry and susceptible to tears or breaks with subsequent development of infection. Minor trauma is also a contributing factor to ulcers that may eventually lead to amputation. Individuals suffering from peripheral vascular disease and diabetic peripheral neuropathy experience a loss of sensation that may exacerbate the development of ulcers. Many times diabetic individuals are unable to detect trauma to an affected area such as the foot. This may result in injury with wounds either going unnoticed or progressively worsen when the affected area is exposed to repetitive pressure or forces such as shear forces during ambulation. Poor healing of such wounds, due to compromised circulation, will eventually lead to amputation of the involved limb. Diabetic foot ulcer (DFU) and diabetic foot infection (DFI) pathophysiology. DFU results from a complex interaction of a number of risk factors. Neuropathy (with alterations in motor, sensation, and autonomic functions) plays the central role and causes ulcerations due to trauma or excessive pressure in a deformed foot without protective sensibility. Once the protective layer of skin is broken, deep tissues are exposed to bacterial colonization. Infection is facilitated by DM-related immunological deficits, especially in terms of neutrophils, and rapidly progresses to the deep tissues. Amputation of a limb can occur due to trauma. The amputation can take place at the site of the accident i.e. a direct limb transection or may be due to severe open fractures or severe neurovascular injuries. Examples of traumatic injuries include compound fractures, blood vessel rupture, severe burns, blast injuries, stab or gunshot wound, compression injuries, and cold trauma. In cases of traumatic injury amputation of the limb is considered either as a life-saving procedure or where the limb is so severely injured that reconstruction will be less functional than amputation. In the case of trauma, limb amputation can also take place months or years after the actual trauma when reconstructive procedures or healing have failed. For a patient with diabetes 'minor trauma' could lead to an amputation. A positive correlation exist between population density and the number of major amputations, this might be due to high quantity of industry and the mode of transport. Nature disasters like earthquakes could be the cause of traumatic amputations. In the aftermath of conflict landmines are a major cause of lower limb amputations. As the result of landmines people are either severely injured or killed every 22 minutes across the globe. Frostbite could either be classified as a traumatic or vascular cause, depending on the country. Lower limb amputation can also occur due to systemic infections such as bacterial infections. The rate might be higher in developing countries and could be ascribed to the lack of antibiotics, adequate medical facilities, and hygiene. Previously healthy individuals, when affected by such infections, are at a risk of amputation of limbs not only as a treatment of choice but also as a life-saving measure. Infections include Meningococcal Meningitis, Meningococcal Septimcemia, Staphylococcus and MRSA infections, and Necrotizing Fascitis. Some lower limb amputations are because of infections following a joint replacement ,or other orthopeadic or vascular surgery . An acquired amputation in a child could be the result of severe infection, cancer, trauma, or blood vessel or nerve abnormalities. 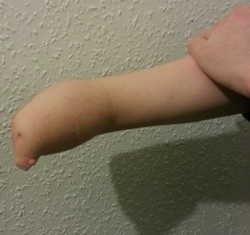 When a congenital abnormality leads to an amputation later in life it is considered an acquired amputation. 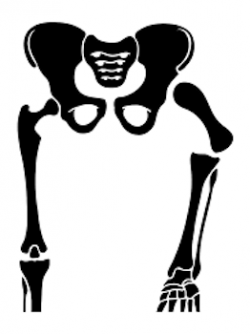 With acquired amputations in children the surgery, rehabilitation, and prosthetic fitting are the same as with adults with the big exception that the child is still growing. Trauma leading to an amputation could be caused by "lawn mowers. traffic accidents, fireworks, power tools, farm equipment, or gunshot wounds". The incidence of congenital limb deficiency is reported to be 50 per 100 000 children born. A child can be born with complete or partial absence of a limb. In order to facilitate scientific communication, the International Organization for Standardization (ISO) developed a system of accurate classification. The mentioned classification is constructed on an anatomical base due to a failure of formation. Congenital Limb Deficiencies are described as either transverse or longitudinal. Transverse Deficiencies resemble an amputation residual limb, where the limb has developed normally to a particular level beyond which no skeletal elements are present. Longitudinal deficiencies include a reduction or absence of an element within the long axis of the limb. The child's remaining limb would be evaluated for prosthetic use and sometimes surgery is indicated to prepare the limb for weight bearing and gait. 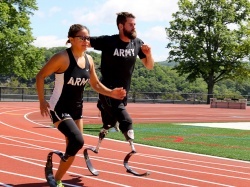 Multiple limb loss is possible but extremely rare. The Choice Between Limb Salvage and Amputation: Major Limb Amputation for End-Stage Peripheral Vascular Disease: Level Selection and Alternative OptionsPeter T. McCollum and Michael A. Walker. Chapter 2C - Atlas of Limb Prosthetics: Surgical, Prosthetic, and Rehabilitation Principles. 2002. The Choice Between Limb Salvage and Amputation: Trauma. Roy Sanders and David Helfet. Chapter 2B - Atlas of Limb Prosthetics: Surgical, Prosthetic, and Rehabilitation Principles. 2002. The Choice Between Limb Salvage and Amputation: Infection. 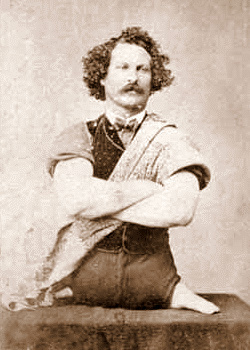 John H. Bowker. Chapter 2B - Atlas of Limb Prosthetics: Surgical, Prosthetic, and Rehabilitation Principles. 2002. The Choice Between Limb Salvage and Amputation: Tumor. Walid Mnaymneh. Chapter 2B - Atlas of Limb Prosthetics: Surgical, Prosthetic, and Rehabilitation Principles. 2002. Congenital Limb Deficiencies and Acquired Amputations in Childhood. Smith D.G. inMotion Volume 16, Issue 1 Jan/Feb 2006. ↑ Dressendorfer, R., Palmer, E. (2014). Peripheral Artery Disease: Clinical Review. Cinahl Information Systems. ↑ Welten GM, Schouten O, Chonchol M, Hoeks SE, Bax JJ, Van Domburg RT, Poldermans D., 2009, Prognosis of patients with peripheral arterial disease, J Cardiovasc Surg (Torino). 2009 Feb;50(1):109-21. ↑ 9.0 9.1 Hampton, S. and Collins, F. (2004). Tissue Viability. Whurr Publishers Ltd, UK. ↑ 11.0 11.1 Turan Y, Ertugrul BM, Lipsky BA, Bayraktar K. Does physical therapy and rehabilitation improve outcomes for diabetic foot ulcers?. World journal of experimental medicine. 2015 May 20;5(2):130. ↑ Carmona GA, Hoffmeyer P, Herrmann FR, Vaucher J, Tschopp O, Lacraz A, Vischer UM. 2005, Major lower limb amputations in the elderly observed over ten years: the role of diabetes and peripheral arterial disease. Diabetes Metab. 2005 Nov;31(5):449-54. ↑ Masharani, U.(2013). Diabetes mellitus and hypoglycaemia. In Papadakis, M.A. McPhee, S.J., eds. Lange 2013 Current Medical Diagnosis and Treatment. 52nd ed. New York, NY: McGraw Hill Medical: 1192-1244. ↑ Clayton,W. and Elasy, T.A. (2009). A Review of Pathophysiology, Classification, and Treatment of Foot Ulcers in Diabetic Patients. Clinical Diabetes, Vol 27, no 2, pp 52-58.